Arsenal will be looking to keep the pressure on Chelsea at the top of the Premier League table when they take on Everton at Goodison Park on Tuesday night. Ahead of the game, Arsene Wenger has been speaking to the media at his pre-match press conference this morning and he’s given reporters a team news and injury update. Unfortunately the boss has confirmed that Shkodran Mustafi has been ruled out for three weeks after suffering a serious hamstring injury during our 3-1 win over Stoke on Saturday afternoon. The German international limped off clutching his hamstring midway through the first half and was replaced by Hector Bellerin with Wenger suggesting after the game that the injury was likely to keep Mustafi out for around 21 days. 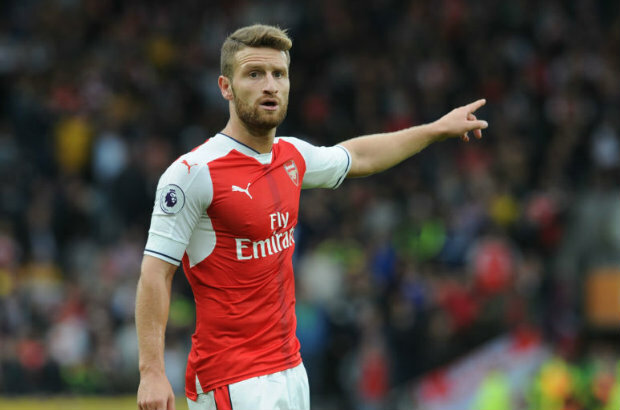 After having time to further assess the injury, the boss has now confirmed that time-frame meaning that Mustafi will sit out the Christmas period and should be back at the start of the New Year. The news comes as a big blow as the centre-back will now miss upcoming games against Everton, Manchester City, West Brom and Crystal Palace while he could also be a doubt for the trip to Bournemouth on January 3rd. Mustafi has been in excellent form since joining the club from Valencia in the summer and has formed a superb partnership with Laurent Koscielny so we’re going to miss him over the coming weeks. Per Mertesacker is back in light training but isn’t expected to be available until the New Year so Gabriel is likely to replace Mustafi alongside Koscielny at the back with Rob Holding also providing support. Wenger also gave an update on the fitness of Ramsey after he missed the win over Stoke with a slight hamstring injury and unfortunately the midfielder is still going to be short for tomorrow’s trip to Merseyside. We’ll have to wait and see how long Ramsey is sidelined for but Francis Coquelin and Granit Xhaka performed well alongside each other on Saturday while Mohamed Elneny is also an option for the boss in the middle of the park. At Colney. Wenger: "We have lost Mustafi from the game against Stoke. Ramsey is still not ready. Mustafi out for about 21 days."